Rithvik Dhanjani (the host) speaks of music being vital for life, and even for him its the same. He talks about how we value and learn about importance of things after it goes away – be it gift, friend, relationship. He suggests sometimes you have to lose in order to win. Bhavya got the habit of losing not in dance but in life in general, and was regarded as loser. Even Randeep fell in the category of being called losers as they were under confident. She fell in love with a misfit, and the key question, Will two losers win the battle of their love ? The story starts with Bhavya at her class looking nervous, and another class fellow Avantika and her friend places sticky notes on Bhavya’s back. Randeep comes to the class with a guitar and a couple of boys speak about Randeep’s aggressive attitude. Soon, the professor comes and asks the class about Mohenjo daro ancient civilization. Bhavya stands to speak about the civilization but soon discovers that all students are laughing as a poster and notes were sticked to her back with call me message. A boy names Randeep as the person insulting Bhavya with the poster, and this makes Randeep to get a shock. Bhavya faces more bully at the hands of Avantika and her group. Avantika knows Bhavya won last year dance competition and asks her to go home without any aspirations of participation. Meanwhile, Randeep speaks to a client who asks him to perform whole night for small amount: 3000 rupees, and even demeans him. He then bumps into Bhavya who apologizes to him. At the auditorium, the dance organizer inform students that Avantika’s dad is sponsoring the dance competition, and moreover there will be the Best Jodi competition unlike last year where there was Solo performance. 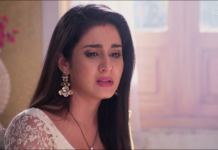 Avantika speaks on Bhavya backing out but isn’t true since Bhavya comes there. Bhavya informs the organizer that Mohit going to be her dance partner. Bhavya later confronts Avantika face-to-face while stammering a bit, and speaks of not backing out. Moreover, she wrote a complaint to the principal attributing if something wrong happens to her then Avantika is responsible. Avantika on the other hand is undetterd and ponders on disrupting Bhavya’s partner. At the chemistry lab, Avantika offers Randeep to become dance partner of Bhavya for 5000 rupees as part of the deal. She also offers him a performance at her dad’s restaurant where potential rock bands and elite clients can be reached. She informs his first task is to remove Bhavya’s partner Mohit in order to become her partner. Randeep makes a hidden pact with Mohit, and this makes Mohit to go away from Bhavya after citing leg sprain. After Mohit’s exit, Randeep offers to help Bhavya by becoming her partner. She wonders why is he helping her. She speaks of not wanting sympathy, and he replies of getting money to dance with her. She thinks he is joking and suggests he is indeed very strange. She informs him of dance is art unlike history, politics, and therefore he needs time to learn it. During her conversation, she suggests he looks hot but that doesn’t mean he can learn dance quickly. He notices what she said and tries to ask but she gets shy and leaves. Avantika comes and compliments Randeep and also reminds him about the deal. Later, Bhavya stammers and ask another boy who backs out on Randeep’s insistence [YHA title song plays]. Bhavya finds Randeep showing interest in dance by practicising and feels happy. Next day, Avantika confronts Bhavya and bullies her by putting a chewing gum on her hairs. Randeep comes to Bhavya’s defense and holds Avantika’s hand. Soon after, Bhavya goes to the chemistry lab to remove the gum and cries profusely as she couldn’t succeed. Randeep goes there and asks her to not cut the hair, and offers help to her problem. He applies some liquid on her hair and gives a word that the gum will get dry and itself fall down within half an hour. She sits beside him and he asks her to ask any question as he observes she wants the same. She asks whether he has really broken a boy’s head resulting in injury and is somewhat confused whether he indulged in violent activity. He clarifies about no role in violence and injury. She speaks how misunderstanding leads to perception and he opens up on not caring for those people who are misunderstood about him. He then asks why she is so scared with Avantika. She replies that dance is everything and dance is the only reason for her to live, and even it sets free. She knows that Avantika is desperate to win the competition but she isn’t concerned much on winning since engaging in dance is key to her. He also opens up on music sets him free and his reason to live. She suggests that dance and music complete each other, and so they are quite similar [YHA title song plays]. Later, both Randeep and Bhavya practice dance with much energy. Both share sincere eyelocks after their dance performance, and Avantika keeps a watch on them from distance. Bhavya and Randeep continue to share eyelocks while smiles and shyness surround them in the class. Avantika again notices they are coming close. She goes to Randeep and confronts him on the deal that he needs to lose with Bhavya. He speaks of knowing the deal and she then asks him to break Bhavya’s leg during rehearsals. Randeep meets Bhavya for rehearsals and she asks him to be calm and feel free. He excuses from practice and shelves to some other day because of his nervousness. Bhavya stops him and gives him a guitar belonging to her dad. He soon learns that her fingers got hurt as she herself tuned the guitar and some repairs as shops were closed due to weekend. She asks him to not break her trust, and wants a promise. She makes it clear of not being concerned of winning or losing. Randeep ponders after looking at the guitar after she leaves. Avantika comes soon after and he informs her of not part of the the deal anymore. She then vows to act herself. On the dance competition night, Avantika comes to Randeep and opens-up that he has done his work and was going to degrade Bhavya’s performance. Avantika speaks well aware that Bhavya is hearing her words. Bhavya gets shocked to learn about Randeep’s deal with Avantika. He admits to Bhavya on coming as her dance partner upon Avantika’s insistence. He bends down and speaks on realizing what she meant to him and is everything for him. He asks Bhavya to forgive him on his mistake. Meanwhile, there is last final announcement for Avantika and Bhavya. She goes to the stage alone and reminisces her words asking Randeep to not break her trust, and their past moments. She gets standstill there and soon Randeep comes and apologizes for coming late to the audience. He speaks about the dance act also concerns forgiveness, and he shares his own story of how a selfish boy befriended a girl for his own selfishness. The boy lost to his heart, and one day she came to know the truth and now the question remains – will the girl forgive him. Bhavya cries while Randeep asks for one chance from her [YHA title song plays]. Randeep goes ahead to dance with Bhavya and soon both begin to dance with much energy and grace. Both share intense eyelocks at the end of their performance and gets applaud from the audience. Both confesses love for each other to become lovestruck. Bhavya and Randeep’s love story ends on that happy note. Rithvik speaks how Bhavya and Randeep fought in the battle between mind and heart not necessarily dance. They come together, which became their strength. After the dance competition, they cannot be called losers, and even more aren’t affected since they are for each other at all times. – Arun had worked in Star Plus’s Mahabharat. I m share my story tell me how ???? ?